It’s true. We can only create new ideas from the things available in our minds. So the more original – read “rare” – our starting point is, the more original our ideas will be. It’s not a hard concept to grasp, is it? As you can see in the graph, I do believe there’s limit to how obscure we can go, especially if we’re dealing with creativity in communication (marketing, advertising, etc.). In this case, we need to help connect the dots inside the target audience’s minds as well. If a reference is too obscure, the message just might fly over people’s heads. In the other hand, if we’re talking about art, for instance, there’s no limit to how unheard-of your references might be. The more obscure, the more original. Compare your mind to your body: if you keep eating junk food all the time, you’re not going to get the best out of it. We have to make a conscious effort to keep a good inspiration diet. Look for inspiration in diverse places. Make sure you also look at things that are away from your area of expertise. A lot of people in advertising look for inspiration within the industry – they use other ads and TV commercials as inspiration for their own work. That shouldn’t happen as often. Getting inspired this way creates “inbred” ideas that feel boringly familiar, old and irrelevant. The best ideas come from insights that had never made their way into advertising before. Fresh insights generate fresh ideas. Fresh ideas generate success. Make a point of looking for obscure sources inspiration. Creativity is also originality. It’s creating something no one has ever seen. You can only do that if you have unique stimuli floating in your mind. Today we can live our lives only skimming through news, and social media feeds. We feel compelled to only read the headlines because there’s so much information thrown our way all the time. To find quality inspiration, though, we need to dig deeper. Just good old-fashion reading. There are great articles out there on the internet, but I find that deeper, more inspiring ideas are still found in books and printed media. Don’t let good habits like taking time to read a book or a magazine fade away. Don’t trade that for consuming the snack-sized bits of information served all over the internet. That’s junk food. We have to feed our mind proper meals to be creative. This is Todd Henry’s advice: “One question that I often get is ‘where do you find inspiring stimuli?’ […] The answer is actually quite simple. I ask people I admire, ‘what’s inspiring you right now?’” It can be anyone – someone you just met or an old friend. You will be gladly surprised with the gold you can dig up with this simple question. 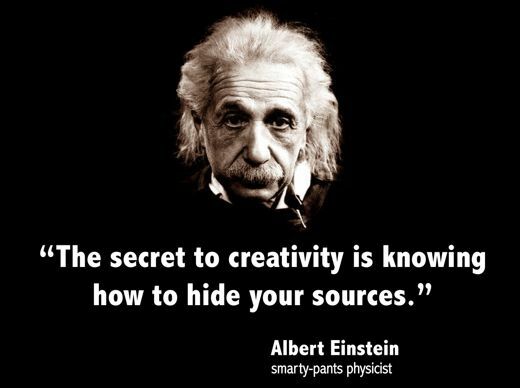 Do you have any hidden sources of inspiration? Care to share? Leave a comment! Good one! Books are indeed irreplaceable and sometimes scanning-kind of reading won’t lead to the source of the knowledge one needs to develop a plan or else. However I think the quick feeds and scanning reading do help me to find something interesting – which might sparks a light of inspiration. Once I’m really into the subject a kind of hunger takes over and I think this is what pushes me to dig deeper and sit with a good book. Something that inspires me is to watch my son (or other kids) playing. The make-believe, non-sense chats, funny faces, the way they marvel ordinary stuff and push their limits puts a big smile on my face and my mind into work. Not really obscure but indeed interesting. Very well said. Especially the part about digging deeper. It seems like too often people troll for inspiration through random websites or Tumblr pages. But true inspiration comes from experiencing something new and different. Immersing and interacting in a new place or situation, which is entirely different than passively staring at a 2D phone or computer screen. Which, don’t get me wrong, can often times serve as a good point of reference but shouldn’t be confused with true insight or inspiration through active experience.